You are across the street from the beach! Tons of windows and views from all rooms! Waking up here you will think you are still dreaming! Master balcony where coffee just tastes better! All bedrooms have balcony access! Beach: Barlow's Landing Beach - 50 feet. 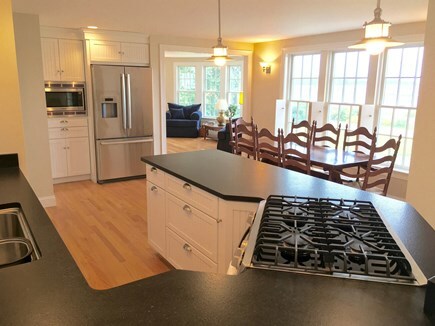 3 Bedrooms, 3 Bathrooms, Sleeps 8! This attractive and comfortable waterfront duplex is new twice! An historic 1752 Cape has been totally restored, with a more than 2,500 square-foot rental portion. The home features top-to-bottom all new construction on the original footprint, complete with modern central air conditioning, unlimited hot water supply from gas-fired, tankless HW heaters; tile baths, modern kitchen with Bosch stainless steel appliances: French-door refrigerator w/ice maker, microwave, gas range w/electric convection oven, and dishwasher. The master bedroom on the second floor has a private ocean-view balcony with a floor-to-ceiling sliding glass door, large double-doored reach-in closet. 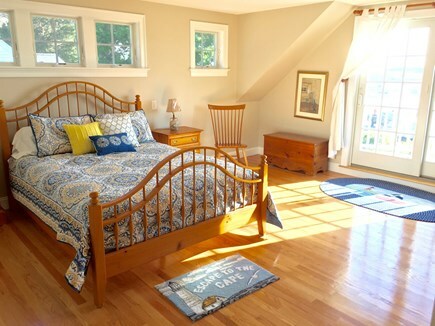 The two other bedrooms have private entryways to a shared ocean view deck, and there is an ocean view porch on the first floor. 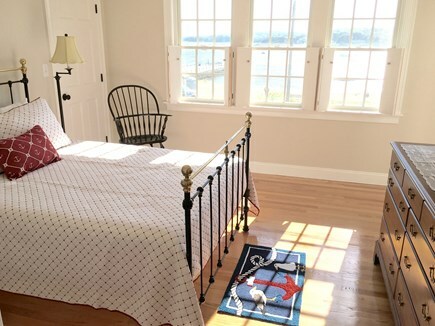 All bedrooms are on second floor for best views, with a smart tv in the master, therapeutic foam mattresses, real wood furniture - Pottery Barn, Hitchcock, Ethan Allan, Henkel Harris Virginia Gallery, etc. 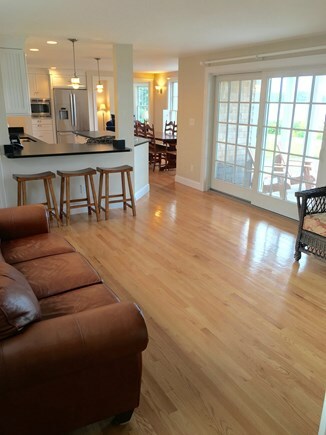 - no MDF - genuine new white-oak floors throughout! There are two tile baths upstairs, one on the first floor with a tile and glass shower enclosure. High-capacity Whirlpool laundry on the second floor, complete with a folding table. Sleeper sofa downstairs, 54'' Smart flat-screen TV, cable, wifi, first floor media room. Water-view granite-paved courtyard, with Weber gas grill. Sleeps eight. Exceptional custom-quality construction and finish, just completed last year! 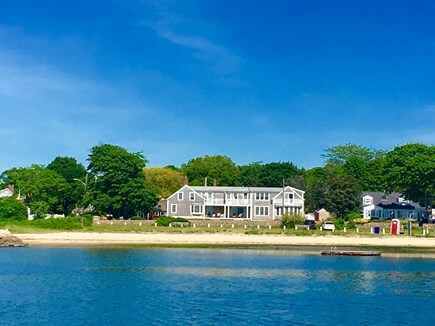 The house is sited so it looks southwesterly over Buzzards Bay and Pocasset Harbor toward Cleveland Ledge Lighthouse, with a clear view of the channel approach to the Cape Cod Canal between Basset's Island and Wing's Neck - all of which give exquisite summer sunsets. Our neighborhood. 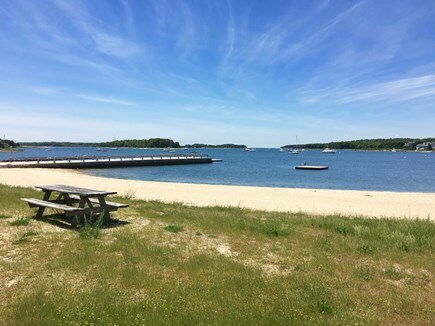 Barlow's Landing and Pocasset Village are part of the Town of Bourne, which was first settled in 1640 as part of Sandwich, and is an area saturated in Colonial and maritime history. Just one example is our house, the original part of which was built in 1752. Even more historic is the Aptuxet Trading Post, the nation's oldest store founded in 1627 by the Pilgrims and located just 4 miles away. The idea of a Cape Cod Canal was first envisioned by Miles Standish in 1623, and even George Washington had survey work done, but repeated attempts to initiate the project failed for three centuries, so it was indeed an historic event when it was finally completed in 1916. 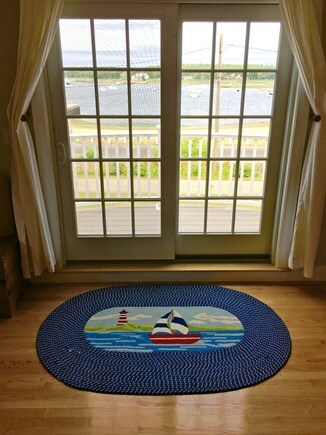 Today it is a passageway for ships and pleasure craft from all over the world, and every waterside window on our house offers clear views of the Buzzard's Bay western approach to the Canal. 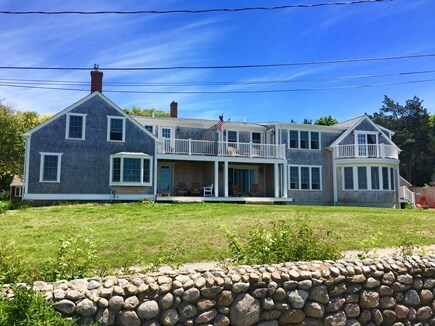 But there are also many local opportunities for more modern interests such as golfing, tennis, fishing, shopping, fine dining (especially local seafood) and every other activity you'd expect from a popular New England resort area such as Cape Cod. For in-the-salt-water activities, you should know that since our beach is on the south side of the Cape, the water tends to be warmer than on the northern and east-facing beaches. And if your kids are old enough to be on the beach unattended, you still have the ability to keep an eye on them, since every room in the house has sight line to the beach. The beach offers a dock and swimming raft, with a dinghy dock for small boats and kayaks, and a paved boat ramp. One other unique part of our location and the ambiance it offers is the quiet, smaller-scale, lower population-density (with less traffic!) and just a little bit slower pace than some of the newer, more hectic parts of the Cape. 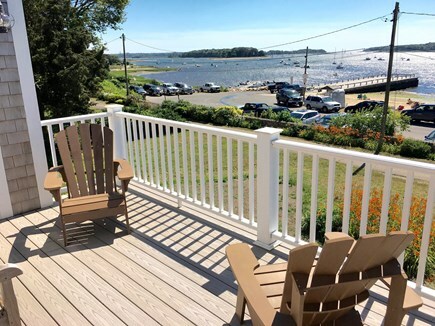 Pocasset Village is still a neighborhood in many respects, with residents whose friendly families have know each other for a least a couple of generations, yet are used to welcoming seasonal guests with genuine hospitality. You'll feel at home here. Nearest beach: Barlow's Landing Beach - 50 feet. Additional availability info: Call for off season rates. This is a Saturday to Saturday vacation rental. Additional pricing info: $175 cleaning fee, State and local taxes of 12.45% will apply. The house was very clean and the views amazing. Our family can't wait to go back! A truly amazing Cape Cod experience! 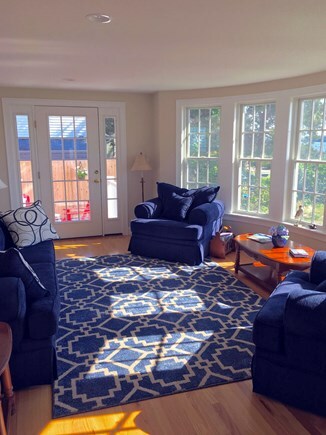 We had a wonderful stay at this beautifully done, immaculate home! From mornings on the beach just steps from the back porch to enjoying the beautiful sunsets from one of 3 porches- you can't beat this location. Listen to the sounds of the ocean as you fade off to sleep and rise in the morning.